This past weekend I experienced the best moment of the trip so far. We arranged a trip to Panajachel with some friends we made at the CSA. 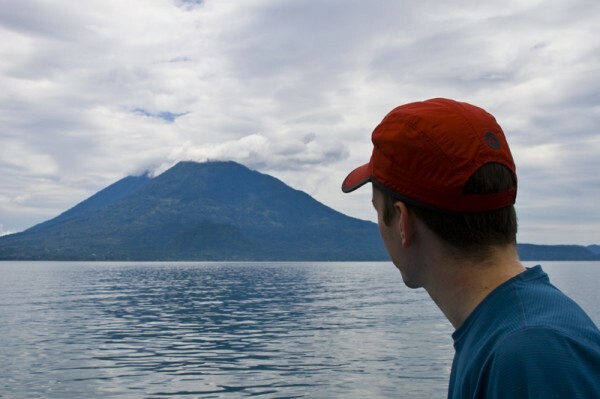 Panajachel is a city on the beautiful lake Atitlan, which is surrounded by mountains and volcanoes. After exploring the town and finding our hotel, we gave in to the guy who had been following us for an hour and paid him to take us across the lake. It was then that I realized what I had gone without for so long. Calm. Silence. The peacefulness that comes when you get out away from cities and crowds and just enjoy nature. I hadn't been aware of just how exhausted I had become these last few weeks. Never having the chance to just be outside without having to worry about speeding cars and persistent street venders. Even when we hiked up the hill overlooking Antigua, I felt bombarded by the sounds of the city below us. The thirty minutes across the lake and back were so refreshing, but also made me very anxious to get to the more outdoors oriented segments of our journey. It was frustrating to go back to civilization again, after so short a time on the lake, but that night was fun in an entirely different way. We just happened to be in Panajachel during their biggest festival. The first week of October is the celebration for St. Francis of Assissi, the patron saint of the city, and it was ridiculous. That night the entire town square was full of people. Loud music played while people danced and fireworks went off all around us. I can't imagine an event going on like this in the States. Safety precautions were pretty much nonexistent. There were no railings preventing people from walking up to scary looking carnival rides and fireworks frequently went off way too close to the ground, sometimes flying directly into the crowd. The main attraction was a 30 foot pole with a little flag on top, with a prize for the person who could retreive the flag. People were constantly trying to climb the pole, sliding back down, stepping on each others heads and piling up at the bottom. The next morning we all woke up early at our $7 hotel and caught a shuttle to Chichicostenango, a town that has a huge market every Thursday and Sunday. We spent the morning wandering around the endless streets filled with venders. I don't know how many times I said "No, gracias" to people that day, but by the time we left, I never wanted to see another Guatemalan mask, necklace or machete again. Even as we rode the shuttle out of town people tried to sell is stuff through the windows. By the time we got back to Antigua that afternoon, everyone was so exhausted we all went to our houses and crashed. All in all it was a fun weekend, although most of it I have no desire to do again. I just want to be back on that lake. I love Lake Atitlan, it's amazingly beautiful. Haha! We split the $7 hotel 3 ways. it's just like Anna's note. I'm dissapointed you didn't climb the flagpole. A pole is probably 5.11? You could do it!